Yao was able to attend the Rockets’ home opener Saturday night against Portland. Because he’s still on crutches, it will obviously be a hassle for him to attend every game. Our Raymond has posted in the YaoMania forum photos of Yao at the game, which the Rockets won thanks to astounding performances by Trevor Ariza (33 points) and Aaron Brooks (28 points). Click here for more photos of Yao at the game. YaoMania met briefly with Yao on Friday afternoon to get caught up on what he’s been doing lately. He’s had his cast off for a few weeks now and said his foot feels good. As seen in the photos from Saturday night, Yao is wearing a black boot and brace when he goes out. He currently leaves home to workout 5 days a week at Toyota Center with his personal trainer Anthony Falsone in the mornings. Falsone will pick Yao up at his house since he can’t drive yet because of his foot. Because Yao is so diligent in going to Toyota Center to work out early each morning, he wasn’t able to watch all of the Rockets’ first two road games because those games started so late on the West Coast, so he couldn’t really speak too much about the performance of the team at that time. But he said the excellent play of Chuck Hayes (who led the NBA in steals after two games) and Luis Scola‘s game Wednesday night against Golden State (21 points) didn’t surprise him at all because he has seen how good those guys have been over the past few years. We talked a little bit about the anti-smoking campaign in China with which he has aligned himself. He said no one in his immediate family has smoked because of their involvement in athletics all their lives, but he sees the effects of second-hand smoke in his country, and has a hard time dealing with it whenever he’s around second-hand smoke. Yao vowed to keep YaoMania up-to-date on how things are going for him from this point forward, so make sure follow YaoMania on Twitter or Facebook. As Rocket fans, we know how it feels after 12 consecutive years to have disappointing ends to seasons. Well, actually it’s been 14 years because anything short of a championship is a downer. But in this case, there was something about this Portland team that made me want to follow how their players and fans were feeling after they lost the series Thursday. Maybe it’s because we’ve been through so many disappointing playoff exits like Rocket fans have endured through the years, we know how it feels and Portland and their fans didn’t do anything to piss us off during the series that makes us want to trash them. From all reports I read, their crowd their the playoffs was very similar to Houston’s in that they were energetic and enthusiastic as you’d expect, but not annoying or obscene. There are always going to be outliers in every crowd that the media might overhype to make the entire crowd look bad, but NOTHING like all those savages in Salt Lake we’ve seen the past two playoff seasons. It was so refreshing to have the Rockets play in front of a playoff crowd on the road that weren’t some of the most vile and obscene in the NBA. Salt Lake always amazes me because even when you’re watching on TV a Utah game, you can see the hatred in their actions and on their faces coming through the screen. And I thought Salt Lake had lots of goodie-goodies like Donny & Marie! Why do they turn into such monsters once they enter EnergySolutions arena? In case you were screwed by TNT and NBA TV and not able to watch the first half on TV, here’s a pretty good highlight reel that has a little over a minute of highlights from the first half. Also, click here to see a video of the hilarious post-game news conference with Yao and Ron Artest. I don’t think I’ve ever seen Yao laugh so hard in my life! HOW SWEET IT IS!!! ROCKETS ADVANCE TO NEXT ROUND! No one really knew what to expect Thursday night before Game 6 between the Rockets and Blazers. Would the Rockets step up and finally show their fans and the world that they are for real? Or would the pressure of potentially blowing another two-game lead in a series be their downfall, and undoubtedly change how this team is constituted during the off-season? Yao Ming posterizes Joel Przybilla near the end of the second quarter on the way to one of the most inspiring games of Yao’s NBA career. After all, twelve years for the Rockets to win a playoff series is a long, long time, and the natives were getting restless. Just think, a Houston kid who entered the first grade in 1997 could have gone through all of elementary school, junior high, and graduate as a senior in high school and never have seen the Rockets win a playoff series. That would leave any fan skeptical they could close the deal Thursday. Well, the Rockets smashed all doubts (at least for a few nights) that they can play their best in a huge playoff game to ultimately win a series. Thursday night they got off to a good start, led by 15 points at halftime, and never relinquished the lead as their defense clamped down, holding the Blazers to 42% shooting and no more than 20 points each quarter. It was a milestone victory that could change how this team is perceived for years, putting a little skip in the step of their fans, and themselves, for the next few days before Game 1 against the Lakers Monday night. With this win, I was GLADLY proven wrong about my prediction that the Rockets would lose the series. But even the most ardent fans who predicted the Rockets would win it have got to admit that after they lost Game 5 in Portland through yet another late-game collapse, everyone had doubts about the Rockets’ ability to win Thursday’s Game 6. Portland had the momentum, and you had to guess which Houston team was going to show up when they absolutely needed a win to avoid an almost certain loss in a Game 7 in Portland. Yao goes up for a dunk after a great pass from Aaron Brooks, one of the best executed plays between Brooks and Yao during the entire series. I’m still bitter that the Rockets lost that game against Dallas in the regular season that put them in the Lakers’ playoff bracket. That could have easily been avoided with a win against the Mavericks. HOWEVER, if you look at how well Denver is playing and how athletic they are, I don’t think Denver would have been that much easier of a matchup. So maybe the difficulty of having to play the Lakers is not THAT much different after all….at least that’s what I’m saying to myself to rationalize that somehow maybe that loss to Dallas wasn’t so bad. I do think that now that the Rockets are only 1 of 8 teams in the playoffs, the spotlight will get more intense as more people start watching their games, and you know the majority of basketball fans will be rooting for them as the loveable underdog they hope can knock off the Goliaths in LA. That will mean a new generation of Rocket fans could be created by those casual fans getting to know more about Yao during this series, beyond what they’ve seen from him in funny American commercials. Unless you were in Houston at Thursday night’s game or watching on a local TV station, it’s too bad that most of America couldn’t see the first half of the game because of the Bulls-Celtics game that went long because of 3 overtimes. Hey, I have no problem if TNT keeps a good game on, but for God’s sake, NBA TV should have picked up the first half of that game until the Chicago-Boston game was over on TNT. I flipped over to NBA TV during that first half I was missing, and do you know what they were showing? A friggin’ press conference from the Orlando-Philadelphia game! C’mon NBA, you should have the right to decide on-the-fly to air games on your own channel for a sport that YOU control and own, even if another network has the supposed ‘rights’ to that game. The big losers in this game were Rockets and Blazer fans, some like me who probably saw some of the most inconsequential games of the season being the loyal fans that we are, but when it comes to seeing one of the biggest games of the season, we’re locked out from seeing it! Go figure! I’m sorry, but I don’t need to be seeing Ahmad Rashad telling me that Philadelphia’s interim head coach is coming to the podium while Houston is mounting a surge to put themselves up 10+ points on the Blazers in a pivotal game! Sorry to vent, but somebody at NBA Entertainment has to get a clue that there are probably hundreds of thousands of people who were just like me wanting to watch an important playoff game that meant the most to THEM. No wonder NBA TV is considered inferior to the NFL Network from a programming and production perspective. By the time the game came on around the 9 minute mark in the 3rd quarter, the Rockets were up by 17 points and it was just a matter of seeing if they could hold on to the lead. But let me recap what gave them that first-half lead in the first place, just in case you missed it. Ron Artest finally had the breakout game we’ve been looking for in quite some time in this series, scoring 12 points in the first quarter to help give the Rockets a 21-19 lead, and 19 points in the first half on 7-of-11 shots. Throw in Yao’s 7 points by halftime on 3-of-6 shooting, 14 Houston bench points (Carl Landry – 6, Kyle Lowry – 4; Von Wafer – 4), and a defense that held Portland to 39% shooting in the first half, and Houston held a comfortable 52-37 halftime lead. If it hadn’t been for Brandon Roy scoring 12 points in the last 6 1/2 minutes of the second quarter, the lead could have been much bigger. In the second half, the Rockets would push the lead to 20 points and it looked like it was going to be party time for fans in the stands and at home. But then like clockwork, the Houston offense started getting stagnant by settling for jump shots. They wouldn’t score for a stretch of 4 1/2 minutes in the 4th quarter, missing 6 jumpers in a row. But then Wafer hit a big jumper, and Artest got back to doing what he does well (but abandons quite frequently): he attacked the basket, missed a shot, but that was perfectly fine since Yao got the offensive board and flipped it in for the score, making it 78-63 with 7:01 left. Aaron Brooks would then steal a bad pass from Steve Blake, and 17 seconds later he would hit a big 3-pointer to make it 81-68 would with 6:21 remaining. Crisis averted, and everyone in the building knew there would be no late-game collapse this time around. For this game, Brooks was the stronger of the point guards (5-of-11 for 13 points, 5 rebounds in about 32 minutes) while Kyle Lowry was only 1-for-6 with 5 points. It seems to flip-flop on which point guard has the better game. If for some reason both have a bad game at the same time, I think that would be just too much for the Rockets to overcome to win any game. 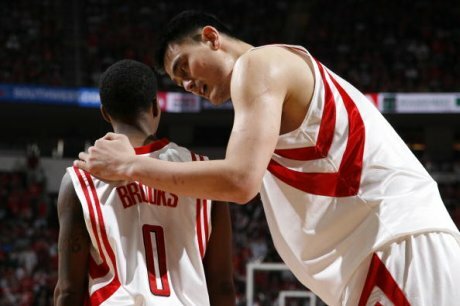 Yao confers with Aaron Brooks during a break in the action. Artest was phenomenal, more aggressive on offense, not taking as many stupid jumpers, and finishing with a game high 27 points on 11-of-21 shots. Hopefully Ron-Ron has all those bad shooting games out of his system for the rest of the playoffs, and he’ll be back to his old self starting Monday. Yao was a man possessed throughout the game, intent on doing whatever it took to win. He caught Steve Blake from behind in the first half to block one of his layup attempts. He poked the ball away from a hard-charging Rudy Fernandez in the 3rd quarter, and then had that awesome posterization dunk on Joel Przybilla near the end of the 1st half. He even dove to the floor for a loose ball when the game seemed to be well in hand. It was one of the best games you could ever watch Yao play in which he ‘only’ scored 17 points on 8-of-16 shots, grabbed 10 boards, and had 2 blocks. In a way, a triumph in this series is something I thought would be poetic justice if the Rockets could advance for the first time without McGrady around. Ever since McGrady reported to training camp out of shape, was forced to take 2 weeks off during the season to get himself in shape, then pulled the stunt where he decided to get knee surgery and didn’t even tell his employer who pays him $20+ million a year about it first, you had to hope the Rockets could pull though with a dramatic series win in this year’s playoffs after having endured so much drama during the McGrady era. Yao hit the floor hard after a foul by Greg Oden. Yao was okay, though, and would continue to play on. 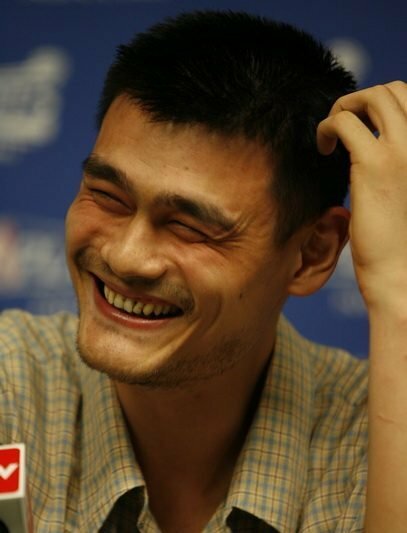 Yao was all smiles during the post-game news conference as he and Ron Artest yucked it up with the press. Click here and here to see photos from the game and afterwards. Speaking of McGrady, his worst nightmare must be coming true. Not only did his team advance to the second round without him, but he is now in an even more awkward position since HE PICKED THE LAKERS LAST WEEK TO WIN THE CHAMPIONSHIP, MEANING HE DOESN’T THINK HIS VERY OWN TEAM IS GOOD ENOUGH TO BEAT THEM. Forget that he said he originally qualified it by saying something like “IF the Lakers beat the Rockets, they’ll win the championship,” because of some lousy excuse that his cellphone signal crapped out during the very moment in time he claims he said that. Just another long list of stupid things McGrady has said over the years. Has he been hanging out with Joe Biden? Before closing this one out and moving on to thinking more about the Lakers in the coming days, I’ve got to say that I have a ton of respect for just about all the Portland players, and I feel bad that any team had to lose this series. They were real sportsmen. If the Rockets had beaten Utah, I could have cared less since just about everyone who is a Houston fan hates those guys. On the other hand, Nate McMillan is an excellent coach and seems like a calm, nice person, Brandon Roy has a ton of class, and I feel bad for Greg Oden who is a good guy, but had a bad game Thursday night by missing a dunk, turning the ball over in the post, scoring only 3 points, and didn’t have a good series overall. But just like Hakeem got the better of Shaq in the 1995 NBA Finals when Shaq was still new and raw in the league, later in his career Shaq would get payback against Hakeem by dominating him as Dream entered the twilight of his career, and that’s what could happen with Oden and Yao in about 5 years. 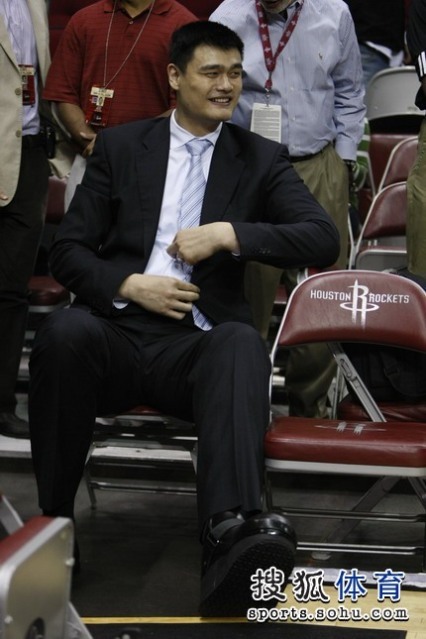 Until that happens, though, I’m ready to see Yao do some dominating over the next couple of weeks against the Lakers. Is this the biggest game of Yao’s Rocket career? 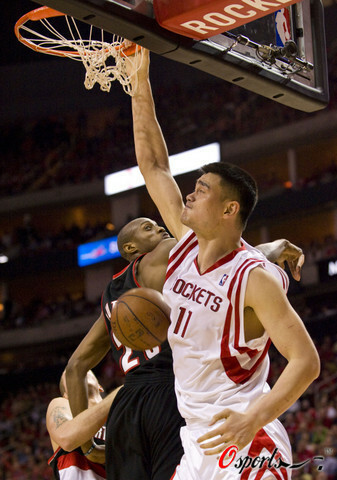 I think Game 6 in Houston is definitely the biggest in Yao’s career in Houston. That’s because if they blow the 3-1 lead they had in this series, the cacophony of questions from the media before Game 7 will rise to an all-time level. Do you guys agree? I was going to say it was the biggest game of his ENTIRE career, but I think the game Yao played with China to beat Germany to advance to the semifinals in the Olympics was the biggest of his career. If they had not won that game, the Olympics would have been considered a failure in Yao’s mind. 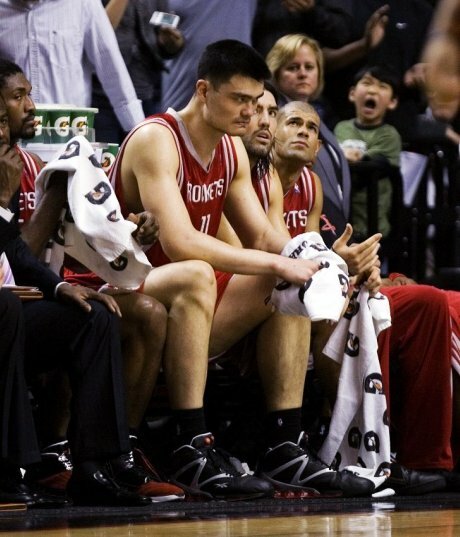 So maybe that will take some of the pressure off of Yao, if he’s feeling too much before tonight’s game. Before the Houston-Portland series began, there was a reason why I picked the Blazers to win the series, which I’ll get into again in a little bit. But for 3 of the 4 games in this series before Tuesday night’s game, I was glad to see the Rockets were on track to put to rest many of the concerns I had for them – like how they blew that last road game of the regular season in Dallas that could have made their playoff path easier. That loss was scarily reminiscent of them blowing that 14-point lead against Chicago soon after the All-Star break. Yao Ming was steaming after realizing the Rockets would lose Game 5, and all the starters were pulled late in the game once coach Rick Adelman threw in the towel. Click here for more photos from the game. In both of those games, they folded when the pressure got tight, didn’t execute, and forgot how to play on the road. I had concerns that Aaron Brooks and Ron Artest would not be able to execute, and that Shane Battier’s offensive output would disappear when he has proved he has the ability to score. But after they showed their mettle and went up 3-1 in their series with Portland, I was beginning to think all of my concerns were a thing of the past and that these players were maturing before our very eyes. However, after Tuesday night’s ‘el foldo’ in Portland where they let the Blazers go on a 15-0 run in the 4th quarter to win the game and stay alive in the series, those former concerns are now back. Granted, you’ve got to give the Rockets credit for battling and staying in the game when it looked like they were going to get blown out in the first quarter when they fell behind 23-13. That’s one thing about this post-McGrady Rocket team where you can give them props – they always battle to stay in games and never really get blown out. But like we’ve seen several times before when the Rockets lose 4th quarter leads…Ron Artest ends up making bad shot selections, and Aaron Brooks tries to do too much penetrating and shooting rather than running the offense. There’s a time and place for Brooks to attack, but in the 4th quarter of a tight game, he’s got to be smarter and understand when the pace of the game slows down, you can’t try to attack the rim and go in for layup attempts when you’ve got a 7-footer in Joel Pryzbilla guarding the basket. Brooks obviously took way too many shots (20) and made only 6. Three of those 14 misses included getting blocked 3 times. He was also only 1-for-8 from the 3-point line, and 3-for-13 overall in the second half. How could the guy who was so killer in Game 1 be so bad just a few games later? His inconsistency is a problem and is one of the concerns I thought could be an impediment to him becoming a star in this league. And why in the world is he taking 8 three-pointers? That means he’s panicking too much on offense, and it’s hard to believe Rick Adelman let him play so much of this game when I thought Kyle Lowry was doing a great job at least running the offense by giving up his own shot and getting the ball to others. I’ve been one of Brooks’ biggest supporters this season for being a scoring guard first more than a point guard, which is okay to me. But when he’s not having a good shooting night, he can’t be McGrady-like and keep firing away when he’s got some good shooters around him, like Yao Ming. Although Ron Artest was pretty good on defense and had 5 assists, he was terrible shooting the ball (again), hitting only 3-of-9 shots, hoisting up ill-advised shots (AGAIN!) in that pivotal fourth quarter run, and turning the ball over 4 times in the game. I don’t know why the hell Adelman can’t get through to Artest to play smarter on offense. At some point, you’ve got to hold the coach accountable for his players’ dumb execution on offense. Idleman says in post-game news conferences the same thing over and over, that the offense isn’t “patient enough,” which is a euphemism for jacking up terrible shots and not trying to find Yao. At some point you would think he would start benching or fining players for not executing the way he specifically demands it. It’s like the inmates are running the asylum in the fourth quarter with the warden nowhere to be found. And of course, Shane Battier pulled another one of his disappearing acts on offense again. 1-for-3 for 3 points. The Rockets really need a veteran like him to step up on the road against a tough team and crowd, especially when a trigger-happy point guard who is having a bad night shooting needs someone to take the scoring burden off of him. It’s games like these from Battier that make me believe if the Rockets can’t win this series when they were right on the verge of closing a team out, then enough is enough: you’ve got to do something and move in a different direction because you can’t afford for your small forward to go disappearing like that. I really believe as Brooks and Battier go, so go the Rockets. On top of Idleman not being able to control how his players react in crunch time on the road, just as important…HOW CAN HE LET THE BLAZERS GO ON A 15-0 RUN TO ERASE A 4-POINT LEAD WITHOUT CALLING TIMEOUT AND GETTING LUIS SCOLA BACK IN THE GAME? Scola was unstoppable in the first quarter with 15 points on 7-of-9 shooting. He picked up his 4th foul in the 3rd quarter, which put him out of the game, but for God’s sake why would Idleman wait so long to get him back in there when they needed point production. An absolute travesty! And one thing I’m sure everyone will say that should have been done more is true to an extent: that Yao Ming should have gotten the ball more. Yao did take 12 shots and made 7 of them to score 15 points. 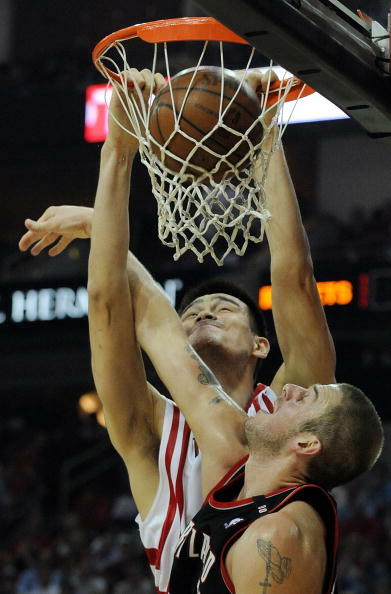 And Adelman seemed resolved to ride Yao as much as he could by playing him close to 40 minutes in this game. But after watching Yao in this series, I’m going to say something that no one is really saying in the media: I don’t think Yao is really doing enough to get himself open. Before the Rockets’ Game 4 victory becomes a distant memory, I watched the 4th quarter again last night on my DVR to cover any ground I didn’t have time to recap on Sunday night. You’ve got to give Lowry, Artest, Battier, Yao, Landry and Hayes props for all they did in that quarter — in other words, it was a complete team effort. I hope you enjoy this play-by-play as much as I did in writing it. One thing I don’t mention in the summary below is the fact I thought earlier in the game, and the play at the 5:04 mark in the 4th quarter, the refs were way too liberal in calling fouls against Rocket players WHEN ROY WOULD RUN INTO THEM! That guy is already commanding way too much respect from the refs. Ridiculous. Look for more of that nonsense in Game 5. Portland closed the third quarter on a 19-6 run to take a 70-64 lead entering the 4th quarter. 7:59 – Nice footwork by Yao in the post for a hook shot and score. 77-73 Portland. Yao got Pryzbilla behind him as Artest drew a double team. 7:05 – Roy takes it strong to the hole and is stripped for a turnover! The defense has been great on Roy in the 4th quarter! 6:41 – Kyle Lowry skies for an offensive rebound and is fouled! 6:36 – Luis Scola hits a jumper from the top of the key to tie it! 77-77 TIE. 6-0 run! Everyone in the building is screaming DEFENSE, DEFENSE as the Blazers bring it down the court! The Blazers miss, and Lowry skies for a defensive rebound with 6:13 remaining! 5:50 – Yao seals off Pryzbilla and scores on a jump hook in the middle of the lane! 79-77. Yao has 8 in the quarter! 5:32 – Scola picks up a foul. 5:23 – Outlaw drives the lane and loses the ball for a turnover. Landry picks up the loose ball. Perhaps no other game on such a big stage demonstrated that Daryl Morey and Rick Adelman’s nirvana has finally arrived. Remember all that “Big 3” stuff? Forget about that for now. That may be a good description of the top 3 U.S. automakers (hell, it doesn’t even count for them since the economy tanked), and it’s not the methodology that’s required of Houston teams to win big playoff games. In my opinion, the better mantra is great defense, and having balanced scoring and talent throughout the roster. With it you can still beat a good team, even if your two superstars in Yao Ming and Ron Artest score 7 points (2-of-7 from the field) and 9 (3-of-8), respectively. 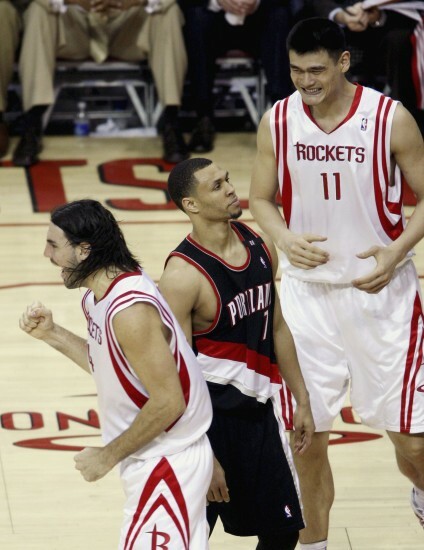 Luis Scola delivered on a night when the Blazers’ defense on Yao gave his teammates lots of opportunities to score. Click here for more photos from the game. No one would ever have thought it possible, but that’s what you now have in Houston, folks. I don’t know about you, but I’m perfectly fine with a few games where Yao scores very few points if the Rockets can win. Who can complain? It’s when they lose that everyone goes bonkers that Yao isn’t getting enough touches, or he’s not being aggressive enough. But people must realize that Yao Ming isn’t being ignored or disrespected by his teammates if he doesn’t get the ball enough to get his points. What’s happening is that the Rockets are so talented that when Yao can’t fight for position to get open, or his teammates can’t get him the ball during that nanosecond when he may be open as the Blazers drape themselves all over him, the Rockets can still make the defense pay. Yao not getting his points is only temporary. As is always the case, Yao will get his points once the Blazers start respecting the other threats on the roster, like Luis Scola’s amazing 19 points on 8-of-15 shooting, or Carl Landry (10 points on 5-of-7), or Shane Battier with an offensive explosion of 16 points and clutch shots (more on that later). Besides, it’s not unusual for very good players to have scoring lulls and explode once they’ve made adjustments after seeing how their defense plays them. Just look at Brandon Roy. He scored 21 points in Game 1, destroyed the Rockets with 42 in Game 2, and in Game 3 Friday night, gets contained with 19 on Friday night on 6-of-18 shooting, and he had to work very hard to get those points. I predict the same will happen with Yao. After scoring 24 points in Game 1 on 9-of-9 shooting, he’s like a Navy seamen who has been out-to-sea for a little too long, waiting for his opportunity to get to shore. When he “arrives,” I predict he’ll explode with another 20+ game in this series doing the things he’s accustomed to doing. He will make adjustments as the defense gives he and his teammates the chance to do that. I think one way that Yao and Adelman have to do that is for Yao to come outside the paint more and take open jumpers. I say if the other Rockets are having a bad shooting night to burn the defense, then forget the mantra of forcing Yao to play in the low post. Let him play outside like Adelman’s former centers in Sacramento Vlade Divac and Brad Miller, and let him shoot more from the outside. I actually saw Friday night Yao positioned more to do that. Other players would be working their way in the paint, and he’d have his hands up ready to receive a pass and shoot a face-up jumper. I say let him do that more so he doesn’t have to work so hard in the low post. I can tell one of the reasons why Yao isn’t getting open down low is that he’s not doing something that Hakeem was so good at doing. As defenders like Joel Pryzbilla and Greg Oden have their arm extended across Yao’s body to try to keep the entry pass coming in cleanly, Yao should be coming TOWARD the ball more to break free from the defender. That means setting up lower in the post, coming out a couple of feet as the ball gets delivered to him, then going to work. It would still require a very accurate pass because chances are the player throwing the ball into him will have a defender who will try to collapse on Yao and deflect the ball. But it can be done if done with precision. 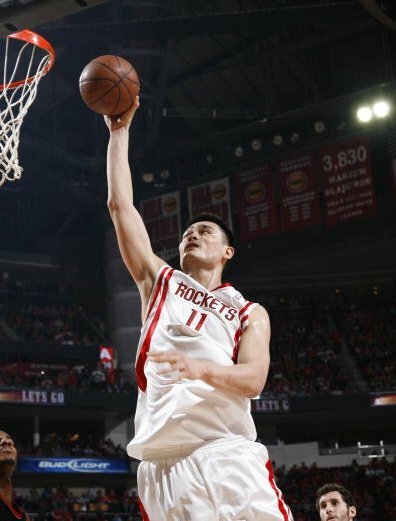 Even though Yao didn’t score that many points Friday night, I thought he did an outstanding job on the boards, grabbing many key rebounds that I don’t think he normally would have pulled down if he had been focusing on scoring so much. Grabbing 13 boards against a pretty good Portland frontcourt can’t be underestimated, especially that big tap-back offensive rebound with 2:12 remaining in the game that kept the possession alive while the Rockets were trying to run out the clock. And defensively, he did an outstanding job clogging up the lane making it more difficult for Roy to get to the rack, including a sweet block of Roy at the 4:36 mark of the second quarter that showed Yao’s help defense has improved significantly this year. He did get into a little bit of foul trouble picking up some ticky-tack fouls, and he’ll have to cut down on that so he can spend more time on the court the rest of this series. I am absolutely floored and thrilled with the restraint that Artest showed in this game. He didn’t take a shot in the first half, and instead focused on doing the little things to help his team, like focus on defending Roy, who scored only 8 points on 2-of-7 shooting in the first half. Artest’s decision to not jack-up bad shots was such a key to this win. He got a little trigger-happy after taking his first shot midway through the 3rd quarter, and would only make 3-of-8 shots overall, but I can live with 5 missed shots per game instead of 12 like in Game 2. Two of the 3 shots he made, of course, were down low when he took it aggressively to the basket. He only took one 3-pointer, and made that. If Artest continues to do that, and focus mainly on defense, the Rockets will be in extremely good shape to win this series. I can’t tell you how much I loved seeing Luis Scola taking jumper and jumper as the Blazers’ defense left him wide open as they focused on covering Yao. And Luis made them pay with 13 points in the first half on 6-of-12 shooting. It’s one of the few times where I’m okay with a player taking so many shots from the same position (10 shots in the first quarter alone! ), because Luis has proved he can hit them. And did you see that sweet shot he hit over Pryzbilla down low, and draw the foul? The guy’s moves down low in the paint continue to amaze me. As long as Luis can stay out of foul trouble (he got into some Friday night that limited his second-half minutes), it’s going to be tough for the Blazers to cover him AND Yao. I forgot to mention in a post before Game 3 that I thought Carl Landry could be a difference-maker in this series because he’s athletic enough to give the Blazers fits. He’d been kind of quiet all series long, but now with Dikembe Mutombo’s career over, I predicted Landry was not only going to have to play good defense, but he was going to have to start off-setting what Deke brought on the defensive end with some offense to make them pay. And boy did he deliver. He hit 5-of-5 shots in the second quarter alone and finished with 10 points, giving the Blazers yet another threat to think about having to cover. Shane Battier is finally starting to understand that he has to be aggressive offensively if the Rockets are going to win this series. Three points a game on 3 shots like in Game 2 isn’t going to cut it. It looks like he finally realized that after scoring 16 points on 6-of-10 shots Friday night. Shane has hit a few big shots in his career to win games, but no shot has probably been bigger than the 27-foot 3-pointer he swished with 4:33 remaining in the game to give the Rockets a 76-69 cushion they so desperately needed as the Blazers were making their run. Attribute that big bucket to hard work in the gym and getting comfortable taking what’s typically a low-percentage shot, and to do it after moving to that position above the 3-point line, stopping on a dime, and draining it. Hopefully that shot will give him the confidence to be more aggressive offensively and not go hiding again. If the Blazers have to think about Battier being an offensive threat in addition to Scola and Landry, it’s just about over. I loved Battier’s reaction after he hit that trey – it still gives me goose bumps just thinking about it. Always the picture of composure, he never really gets emotional like that. That’s what I love about the playoffs – it brings out all the emotions in even the most composed. Although Aaron Brooks didn’t have a big explosive game (only 3-of-11 for 11 points) like he had in Games 1 & 2 where he averaged 25 points, I was thrilled with what he continues to bring to the table: the Rockets’ best threat to get into the lane and create havoc with the Blazers defensively. Time after time Brooks would exploit his advantage over Steve Blake, blow past him into the lane, then dish out to an open shooter or take it to the rack himself for a score. I really believe without that dimension, the Rockets would have become very predictable for the Blazers to defend in this game and they would have lost it. And A.B. did his job as a point guard by hitting clutch free throws down the stretch as the Blazers were fouling him intentionally to try to stay within striking distance. Sure, he missed a couple of those free throws, but on the second one he missed with just a couple of seconds remaining in the game, he had the presence of mind use his quickness to go grab the rebound and close out the victory. It really looks like Brooks is coming into his own and bringing more to the table than what Rafer Alston did. Brooks had 5 assists Friday night, too, so give him credit he’s not a one-dimensional player. And his backup Kyle Lowry continues to impress, being aggressive himself pushing the ball on the fast break and forcing the defense to react. Lowry would finish with 8 points on 2-of-2 shooting from the field, and 4-of-6 from the line. It was really the scoring of Lowry and his bench teammates like Von Wafer and Landry in the first half that were huge keys to the win. In that first half, that trio led the charge with 12-of-15 shooting (80%) and 19 points! Probably the weakest link on the floor in the second half was Wafer. He took it strong to the hole a couple of times for amazing dunks, one on a fast break after a steal, and another on a Lowry-led break where he threw one down that brought the house down and made me have to rewind my DVR 5 times to soak it all in! But outside of those 2 dunks, he made only 1-of-7 shots, becoming a ball-stopper and Artest/McGrady-like jacking up too many jumpers. Stick to your game, Von: take it to the rack and save the jumpers for less important games in the regular season. After being torched by Roy and Lamarcus Aldridge in Game 2, the intensity the Rockets had defensively to start the game was a joy to watch as they clamped down and held the Blazers to 37% shooting in the first quarter, and 42% overall. They out-rebounded them 42-31 and blocked 7 of their shots, with 4 coming from Battier! Another reason why I love the intensity of the playoffs! Even with the great D, though, the Blazers showed why they are one of the best comeback teams in the league by hitting lots of 3-pointers down the stretch to make it very close. Rudy Fernandez and Blake were 5-of-7 and 4-of-7 from 3-point land alone, something they hadn’t done at all in Games 1 & 2. But I’m not as mad about how they came back like that. Hitting 3-pointers consistently in a series is tough to do, and if they do it again starting out in Game 4, I have faith the Rockets’ defense will adapt. You are currently browsing the archives for the vs. Portland category.